I don’t really like pumpkin. There, I said it. The most sacrilegious words ever to be uttered by a blogger it seems. I mean it is autumn and there are pumpkins galore, at the farms, the stores and the blogosphere. I look at them, ooh and aaah at the sizes and the shapes and even at how pretty they are, but not one of them ever goes home with me. My introduction to pumpkin was from our Kuwaiti neighbours back in England, the ones who made the delicious goodies and sent them down to us. One of the dishes that used to be sent down regularly was a savoury preparation of pumpkin; where chunks of the amber hued fruit were cooked with lamb in a tomato based curry. It was really good and I enjoyed eating the soft, orange, sweet flesh of the pumpkin. So, what happened? Store bought pumpkin pie is what happened. In England, my mother didn’t make pumpkin anything. In fact, I don’t ever remember seeing a pumpkin growing up (and I mean all winter squash) at least not in our house. So, on my first trip to the US we happened to be here around Thanksgiving. We were invited to a gathering at my parents’ friend’s house and that’s where I had my first experience with American pumpkin pie. And I’ve hated pumpkins since. Fast forward a few years, a wedding, a husband and four children later, and here we are. I have American children, and even though during their childhood, I never made pumpkin anything, they being Americans, wanted pumpkin pie one year. I was in a serious debate with myself, after hearing that request. But, I am a cook and a baker and I don’t back down from a challenge (unless it seafood, then I have no problem letting it go). I went straight to my favourite pie maker, Rose Levy Beranbaum and searched her book to see what kind of a pumpkin pie recipe she had listed. Her recipe looked normal, it didn’t have a million different spices, or tins of milk or where you opened a tin of pumpkin mixed it with eggs and poured the batter into a crust. No, hers was a recipe. It involved cooking the pumpkin and adding cream and a hint of spice. In short, it’s a perfect pumpkin pie recipe and it’s SO good. It has since become a staple dessert on our Thanksgiving table. Laith requests it every year and then eats almost half of it by himself. Last year, my husband complained he only got one piece. I think I will have to make two this year. So, yes, slowly but surely, I am getting over my dislike and fear of pumpkin. I still haven’t progressed to actually buying one from the farm stand yet but we’re getting there. Funny thing is, I don’t mind other winter squash, which actually happen to be pumpkins also, it is just those orange ones. To help the process along, I thought this year I would attempt something other than my usual pie. After joining the Improv Cooking Challenge two months ago, I finally had time to take part this month. The Improv Cooking Challenge is hosted every month by Kristen Baker of Frugal Antics of a Harried Homemaker. It just so happened that this month the challenge was cake and frosting. I jumped on the opportunity to use pumpkin in my cakes (because it’s autumn and all, and you’re not a reputable blogger unless you have a pumpkin recipe on your blog) and make those cakes for Laith to take to school as his treat for our Eid ul Adha holiday and fulfill my challenge for this month. I am quite brilliant. So, here are my Pumpkin Mini Bundt Cakes with Cream Cheese Frosting and topped with some deliciously, crunchy pumpkin seed brittle. And you know what? I love them. Line a baking tray with parchment or liner. Place the sugar in a large skillet with a very thick bottom. Make sure the sugar is in a very thin layer not more than 0.1″/3mm, use a large pan. Heat the sugar gently until it turns a golden brown colour. Do not stir at any time. There may be little bits of undissolved sugar and that’s fine. Carefully, add the toasted seeds and stir with a wooden spoon until they are evenly coated. Pour the coated seeds onto the lined baking tray and let cool. When the seeds have cooled, break the brittle into medium pieces so they can top the cakes. Mix the flour, baking powder, baking soda, the spices and salt together in a bowl, keep aside. Add the sour cream and pumpkin puree and mix. Add the flour and the milk. Spoon into the mini bundt pans or into cupcake tins. Bake for 20-25 minutes until firm and golden brown. Let cool in the pan 10 minutes and then remove the cakes from the pans and cool on a rack before frosting. Sift in the sugar and beat until fluffy and smooth. Add the cream and whip until firm, and peaks form. Spoon into a piping bag, if desired, or can just spread the frosting on the cakes. Top each cake with a piece of pumpkin seed brittle. I made these little cakes a few times and I made them with oil, with butter and oil and just butter. They all turned out really well. However, the butter ones do well in the bundt pans because it's a firmer cake. If you want a more fluffy, box cake mix like texture, use ½ cup of a neutral oil instead. I used avocado oil and they were excellent, moist and fluffy. Oil will work really well in cupcakes. Also, for the frosting, make sure your heavy cream can be easily whipped. If you doubt the ability of your heavy cream, whip the cheese and cream separately and then combine the two. Hope you all have a wonderful weekend. I’ve been busy this week with Eid and all, but will visit all of you this weekend and catch up! These will be perfect for the upcoming Thanksgiving holiday, thanks in advance! Cute little pumpkin treat! Yum! Thanks Kiran! Yes, pumpkin took a while to get used to! These are so cute, great work! Can’t wait to see what you post next month Anne! Your creations are always wonderful. Thanks for stopping by! Denise Browning@From Brazil To You recently posted..Fried-Apple Cobbler Bars…A Delightful Autumn Treat! I hate pumpkin too but I will eat it in a cake. These mini bundts are lovely. The pumpkin kind of hides in te name and adds moisture! A little bit of spice to enhance and we’re ok :). Thanks for your comment Caroline! I’m glad to have discovered someone not liking pumpkin. I am slowly getting accustomed to its taste and texture. Actually, I don’t mind the taste but the way it turns to mush…I dislike it! But as you said, being a blogger and not doing something what everyone else is loving to bits makes me feel isolated. So I have jumped into the pumpkin bandwagon too and made quite a few dishes this time. The one thing however,I love about pumpkin is its bright colour and that is showing so brilliantly in your cakes. They sound as amazing as they look! I made the brittle too…we call it praline..and I bet it’s the perfect accompaniment to your bundt cakes. Beautiful pictures..love them! Nazneen I am not big pumpkin fan either as people are here in west but i do remember my mother using squash (which is from pumpkin family) in cooking halwa, fritters and spicy and tangy curry. Though I never had anything baked. I love your addition of pumpkin puree in cakes. The pumpkin brittle on top really sets it apart from other pumpkin cake recipes. Yes, my mother made kaddu halwa, and it’s my favourite actually, I tried making the halwa using a green butternut squash and it came out really well. I don’t think I like the overly spicy treatment of pumpkin. I kind of agree with you on pumpkin. It really doesn’t have a lot of flavor. All the spices that are added make it what it is! I love this recipe and I love that pan! Thanks Abbe! I got those pans from World Market when they had their 50% off sale a coils of weeks ago 🙂 it was a great deal. I think the spices get to get over done and I think that’s what I don’t like about it all. Wow, great flavors in these! Super recipe. Pumpkin is actually kinda bland tasting compared to most winter squash, IMO. This is actually one of those instances where the canned is often better than the fresh – I’ve never been disappointed with canned pumpkin, but my results with fresh pumpkins have varied quite a bit. Sometimes they have spectacular flavor, more often the flavor is dull and muted. Anyway, pumpkin is actually better in savory dishes, IMO, but in sweet ones I always like to include lots of cinnamon. Hi John! Thank you! I agree, I have found tinned pumpkin to be way more consistent. I bought a small sugar pumpkin way back to make a pie and it was not what I expected. The flavour just isn’t strong enough and seems watered down. I found the same thing with sweet potatoes. But yes, the pumpkin definitely needs spice but I hate the commercial pies with their generic pumpkin spice mix, its flavour is way too overpowering, I think it’s too much cloves. I didn’t even use cloves and chose to use allspice instead. They tasted much better with a touch of spice. I love pumpkin. Roasted on its own, in risottos, in pasta, in cakes, in bread. But, I have never had pumpkin pie or pumpkin from a can (canned pumpkin is not something that you can find in Australian supermarkets) 🙂 There’s a tiny little town about 1/2 an hour north of where I live that has a pumpkin festival in May every year, where locals bring their biggest pumpkins (some weighing hundreds of kilos) and compete for prizes. No, I’m not joking. It’s pretty fabulous, a little bit like a country fair with food and things, although in the last few years it seems that all of Canberra has found out about it and it gets a bit too crowded for my liking! Your cakes look gorgeous, and I bet that brittle has fabulous texture!! I’m on a mission currently to get the Brit’s to appreciate pumpkin because I love it! 😀 I love these they are so so cute! While I DO like pumpkin, (and prefer to make the puree myself from a REAL pumpkin) last Thanksgiving my son and his fiancee came for a short visit and for the family dinner. The dear girl is from Charleston and insisted on making the pies. She made SWEET POTATO pies instead of pumpkin. They were delicious. I might even switch to sweet potatoes myself. In fact, I did tell her that I now prefer her pies to mine. 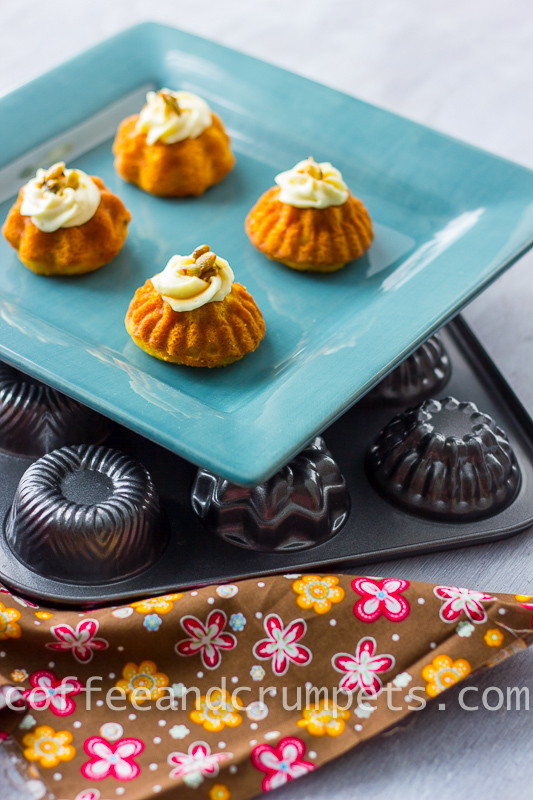 Your mini pumpkin cakes look delicious, too. I am not sure, but I think it is the fragrant and warming spices we use in pumpkin anything that make us feel cozy and nostalgic! I just fixed the link to my Flickr page. Thank you Monica! I didn’t have a mini bundt cake pan for ages and then when I decided to make these for my sons school treats, I decided to get one. Luckily, one of our local stores was having a half off sale on pans and I was lucky to grab 2 for half off, I think they’ve paid for themselves because I’ve used them like 6 times already! I love your little bite size treats…they are pretty and look so tasty. I am with you on the pumpkin thing, I’m not terribly into it, except maybe sometimes in savoury dishes. This time of year, all those wonderful pumpkin recipes are kind of lost on me. I’m American, I should love the stuff. I so agree with you! I see a million pumpkin recipes and not one appeals to me! I can handle a pumpkin cheesecake and I’ve made one before, but all those other things like bars and cookies and mousses…yuck. You are a funny man, John! I know, I know, I should give seafood a chance. I guess I’m just not a huge meat person. And yes, make lots of brittle, it’s great stuff! The pumpkin seed brittle on top is the perfect touch for these cute little pumpkin goodies. So glad you were able to join us this month!! Thank you Kristen! I am glad I was able to as well. I’ve been wanting to each month but a crazy schedule just gets in the way 🙂 Thank you for stoping by! Pumpkin seed brittle? ~ GENIUS!!! And I love your bitty bundt cakes, too. Thank you Melody! That brittle turned out so well, it’s hard to stop eating it! These look so pretty Nazneen. We do get into the pumpkin trend whether it be for the kids or because we see it everywhere. Growing up, pumpkin was a savory thing for me too, I’ve slowly started loving it in desserts. Really, I love pumpkin pie, but not with a ton of cinnamon, I in fact use cardamom instead. I am gonna try your mini cute little cakes, I have a ton of pumpkin puree frozen up. I always find it funny how crazy everyone gets in fall as soon as pumpkins appear! I am getting used to them now, I didn’t grow up with them so it’s a new challenge for me. Have a great weekend too Ash! Ahhhhmazing Nazneen!! The cakes look delicious. My son has been asking for a pie for ages now, and I need to make one this year. But I will make these cakes as well while I am at it. Just loving it! Thanks Minnie! They did turn out well and were kind of cute 🙂 I have a good recipe for pie if you need one! I think you’re right GG, I don’t remember ever seeing a pumpkin till I came to the US. It took me a long time to like pumpkin pie, and I’m still not sure I do! Kids love it though so I make it. I do like other winter squash buts it’s just that ubiquitous big orange one!